Chris Flach – Award for extraordinary enthusiasm in engaging with and supporting MLES. 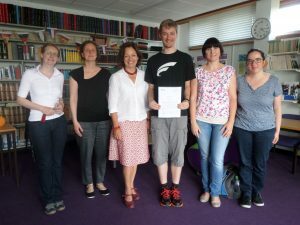 Chris Flach, Second year student of Law with Legal Studies in Europe and German Studies, was awarded for his extraordinary enthusiasm in engaging with and supporting the Department of Modern Languages and European Studies. Throughout his two years at Reading, he showed his enormous interest, dedication and commitment for the German language in particular and the Department as a whole by promoting Modern Languages as a student ambassador, being involved in Outreach and Teach meet events, creating a departmental video workshop, playing a leading role in the German Drama Group and being actively engaged in all other extracurricular events and activities of German Studies. The Department has highly appreciated his outstanding support and is wishing him the best of luck for his year abroad at the University of Trier in Germany. An MRes in Modern Languages – pathway in Italian Studies?? Isn’t it all rather serious? Well, yes, I can’t deny that I felt a bit apprehensive in September, clutching my new Campus Card with the word POSTGRADUATE in bold letters, looking at the emails about modules on Research Skills & Methodology, and optional module topics such as Cultures of Fascism, trying not to dwell on the idea of a 20,000-word dissertation – and wondering. These are some of the questions I asked myself – and the answers! Is there too much to do? Happily, I’ve chosen the part-time option, two years. Time to breathe. I would recommend that to anyone who has an extra year to spare. There is a lot to do, presentations, essays – and that dissertation – but I have above my computer a card with two words of encouragement: NO EXAMS. What about the working in isolation? What if I can’t decide on a topic? I thought I had decided before the course started. I had even started compiling a bibliography. Then the Methodology module involved choosing an item from the Special Collections to analyse. I set aside an hour to read an innocuous blue-covered diary, and dragged myself back two hours later to 2015 and to the assuredness that I had found my topic. An unforgettable moment in an exciting year. So are there any more questions? Oh yes, plenty – and I’m off to request “my” box of documents in the Special Collections Reading Room and start looking for the answers… but that will be another story. It is with great sadness that we have to report the passing of Professor Peter S. Noble , on 31 May 2016. Professor Noble was for many years a central figure in the life of the Department of French Studies, which he joined as a young lecturer in 1966 and of which he was Head of Department between 1991 and 1999. Peter was an eminent scholar of international stature in the two quite distinct fields of medieval studies and Quebec literature. His many publications cover medieval chronicles, Arthurian literature, the French epic and early modern women writers as well as Canadian writers. An active member of the Graduate Centre for Medieval Studies, of which he was Director twice (1983-1986 and 2004-2005), Professor Noble regularly attended the Centre’s events until poor health no longer allowed him to do so. Professor Noble was also a dedicated teacher who derived much fulfilment from student contact and kept abreast with pedagogical best practice; he made a point of teaching both content and language at all levels until he retired in 2007, and could remember all of the many students he taught. His colleagues will miss him. Beginner’s language degrees are in the news at the moment. Here at Reading we have some news too: we’re very excited to announce that we will be launching beginner’s French for 2017 entry, to join our beginner’s Italian and Spanish courses. We have a longstanding specialism in this area, having provided accelerated Italian for many years. A beginner’s language degree (or ab initio language degree as universities call it) involves learning the language from scratch, but going on to complete the degree at the same level of knowledge and fluency as students who might have a GCSE or A-Level in that language. They are far from being a new phenomenon. It has always been common for language students to pick up another language at degree level. Having more than one language improves your employability in competitive fields such as language teaching, and translating/ interpreting. If you think you might be interested in learning a language from scratch, you can find out more about how students have found the experience, in these blog posts by our students Sabrina and Jess. Professor Catherine Léglu explains here about the benefits of ab initio language degrees. LIBT Uk on If it wasn’t for my decision to learn Italian at Reading, I simply wouldn’t be where I am today!